Plane in Storm is a fast paced arcade game for your Windows Phone that has you piloting a plane, trying to out run bad weather, dodging flying objects, storm clouds and lighting bolts along the way. The game is nicely animated with two game modes and plenty of bonus items. I'm not sure if Plane in Storm can hold up to marathon gaming sessions but it's a nice way to pass short bits of time with. From the main menu for Plane in Storm you have options to play the game, view the online leaderboard/achievements, visit the game's Store, and view your game progress. In the upper left corner is a mute sound button and that is the extent of Plane in Storm's settings. Plane in Storm has two game modes, "Reach in Time" and "Destination Unknown". "Reach in Time" has you racing the storm to a finish line. "Destination Unknown " challenges you to see how far you can fly before the storm catches you. The game screen for either is just about the same. You have flight controls in the lower left corner and your score in the upper right corner. With the "Reach in Time" mode you also have a progress meter in the upper center of the screen. Speaking of controls, I wouldn't mind seeing the option to move the controls to the right side of the screen. While you get used to having the controls on the left, it did feel a little out of place at first. Game play is simple... don't let the storm catch your plane. Sounds simple but you've got various items being slung about the sky (houses, pianos, etc.) that you have to avoid or they'll bounce you into the storm. You also have smaller storm clouds that slow you down to let the storm catch up to you and smaller lightning clouds that will ruin your day as well. The further you progress in the "Destination Unknown" mode and the closer you get to the finish line in the "Reach in Time" mode, the storm picks up speed and your margin for error in piloting your craft gets smaller. While you may survive bumping into a house or clipping a storm cloud early on, the game won't be as forgiving the further you fly. You also have bonus stars you can collect as you try to outrun the storm and the further you go, the more points you earn. The more points and stars collected translates into coins that can be spent to upgrade your plane or buy bonus items from the Store. Your final score can be shared via email, Twitter or Facebook. The are bonus items that are available from the game's store include cloud cleaners that moves out the clouds, nitro that gives your plan a speed boost, a lightning protector, and a spring that protects your plane from flying objects. All in all, Plane in Storm is a fast paced, challenging game. Flight controls move the plane up and down and can be a little on the sensitive side. If you fly into the top or bottom of the screen, the plane has a tendency to initiate a loop which sends the plane right into the storm. Flying objects and other obstacles seem to come out of nowhere and if you blink, you may run into something that will let the storm overtake you. 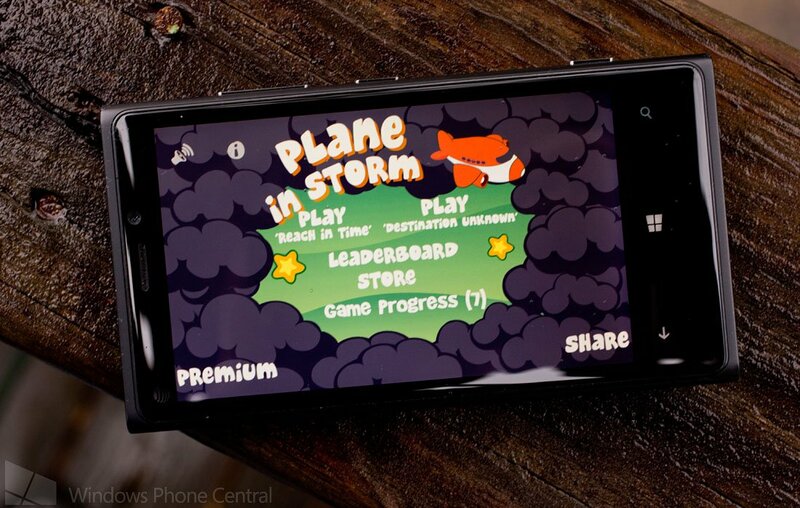 While a nice game for your Windows Phone, Plane in Storm can be a little frustrating with the challenge level. Plane in Storm is a free game for you Windows Phone that you can find here in the Windows Phone Store.